Two of the meadowhawk (Sympetrum) species that occur in Arizona are the Black (S. danae) and the Band-winged (S. semicinctum) Meadowhawks. 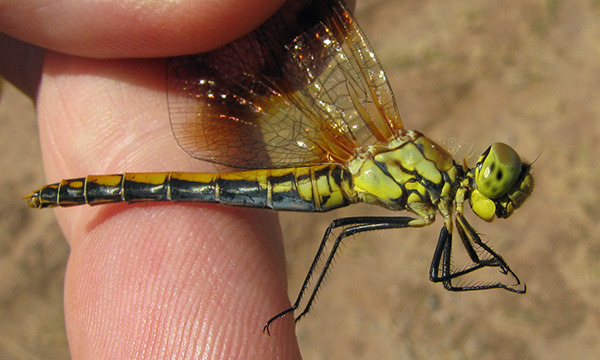 The Black Meadowhawk is normally found only in high boggy wetlands of the White Mountains (Apache Co.) but the Band-winged Meadowhawk has a considerably wider distribution. Mature males of the two species are readily separated from each other, but females look much alike. To separate female Black from Band-winged Meadowhawk, focus on the color of the thorax and the first abdominal segments. Black Meadowhawk: front of thorax is rich brown, thus contrasting with yellow sides. Sides have complex pattern of yellow dots surrounded with black markings. Band-winged Meadowhawk: front of thorax is light brown and does not contrast markedly with yellow sides. Sides have black lines but lack the complex pattern seen in the Black Meadowhawk. Black Meadowhawk: first segments mostly yellow, lack conspicuous black lateral stripes. 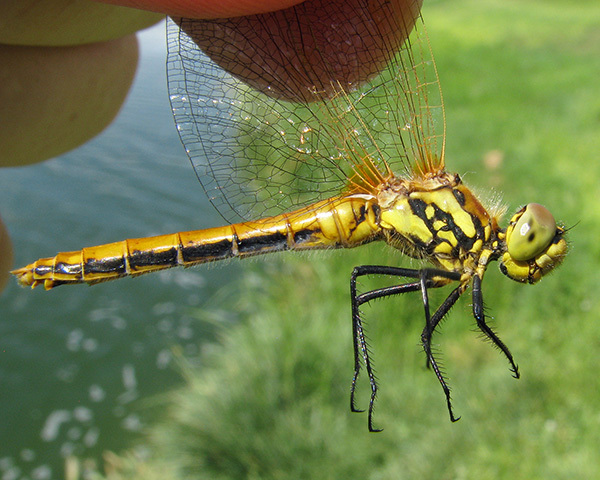 Band-winged Meadowhawk: first segments have conspicuous black lateral stripes. Lateral view of female Black Meadowhawk, Sympetrum danae, AZ. Lateral view of female Band-winged Meadowhawk, Sympetrum semicinctum, AZ.